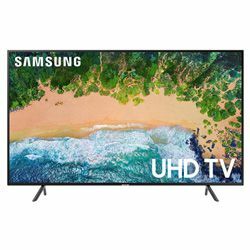 The test Samsung 65NU7100 vs 65NU8000 gives an opportunity to compare two mid-level Samsung TVs that have some difference in price (65NU8000 is more expensive). Both models appeared in 2018 and have many similarities in their functionality and building. Both Samsung 65NU7100 of NU7100 series and 65NU8000 of NU8000 series are 4K UHD units with a Contrast Enhancer that makes the picture deeper across the whole screen. The TVs are based on the Tizen 4.0 software with a quad-core processor to run Tizen Apps smoothly. Besides, they go with Smart Hub to provide premium entertainment. Either 65NU7100 or 65NU8000 can deliver any content with a high-quality picture due to their UHD Upscaling feature. However, their picture accuracy is fading at an angle as other VA-display TVs. 65NU8000 can boast a better picture clarity because it comes with Supreme UHD Dimming while 65NU7100 has less advanced tech UHD Dimming. Besides, 65NU8000’s Dynamic Crystal Color provides more color details. Both TVs have a great low input lag for gaming. 65NU8000 has good motion handling and response time to avoid motion blur in actions, games, and other fast videos. The test Samsung 65NU8000 vs 65NU7100 revealed some differences in their native contrast ratio. 65NU8000 has a higher contrast ratio than 65NU7100 that’s why it produces deep black and bright light scenes versus 65NU7100’s lower brightness. So, 65NU8000 is great for watching both SDR and HDR content while 65NU7100 is better for SDR only. 65NU7100 and 65NU8000 have a decent sound without rumble to produce clear dialogs and deep bass, but they are not loud for a large room and need external speakers. 65NU7100 is noted for its high-end elements in the design. It has a very sturdy stand with the wide footprint to place a soundbar. The TV is rather thin but its borders are average with a simple plastic texture. 65NU8000 has a center stand and its design isn’t typical for Samsung TVs. It looks stylish but makes the TV wobble a little. It has thin borders and the TV is thin itself too. Both 65NU7100 and 65NU8000 have a well-textured back panel with cable management. Great replacement for a PC monitor due to flawless support of chroma 4:4:4. It is possible to set up for time recording. It doesn’t support 1440p resolution in games that is rather popular with gamers now. Bixby voice assistant to navigate the setting menu. One Remote Control to manage the TV, Smart Hub, and other connected devices. No self-calibration to adjust the sound.